I have been given permission to share this story about the KP Lantern project, which is currently hosted on the Kaiser Permanente Intranet for 200,000 physicians, nurses, and staff. You can learn more about KPLantern here. 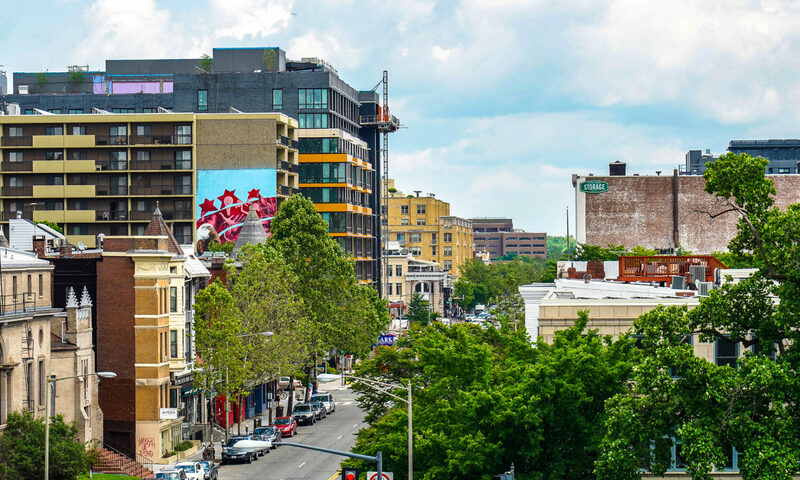 Thanks to Jennifer Downey in our National Public Relations and Communictions organization for putting this story together, and my colleagues on the Lantern team, led by Dana Ragouzeos. June is LGBT (Lesbian, Gay, Bisexual, and Transgender) Pride Month, and as a national spotlight shines on that spectrum of voices, Kaiser Permanente shares a recent effort to illuminate one that often goes unheard: the transgender voice. Kaiser Permanente has a longstanding commitment to providing personalized, high-quality health care to meet the needs of the diverse populations it serves. In 2010, KP was the first health care provider and hospital system that the Human Rights Campaign designated as a leader in LGBT health care equality, and for the past five years KP has consistently achieved leadership status for all of its hospitals. 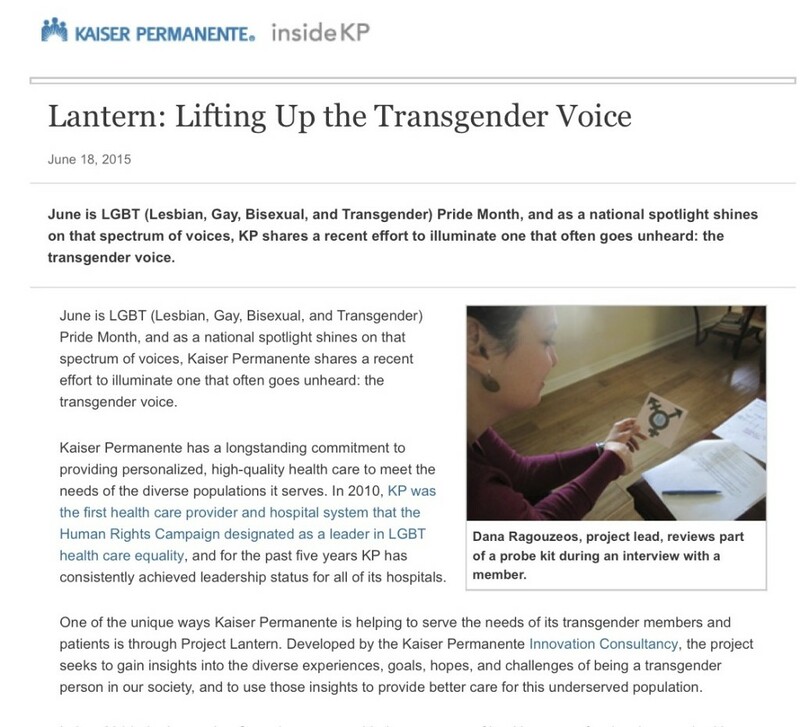 One of the unique ways Kaiser Permanente is helping to serve the needs of its transgender members and patients is through Project Lantern. Developed by the Kaiser Permanente Innovation Consultancy, the project seeks to gain insights into the diverse experiences, goals, hopes, and challenges of being a transgender person in our society, and to use those insights to provide better care for this underserved population. In late 2014, the Innovation Consultancy assembled a core team of health care professionals to work with a group of transgender members who volunteered to share their life and health care experiences in a confidential, safe format. In early 2015, the team embarked on a three-month “listening journey” — using a human centered design approach to capture and learn from those transgender voices. In the field, the team gathered stories and quotes through interviews, group discussions, journaling, and by shadowing participants, who ranged in age from mid-teens to mid-60s, and at all stages of transition. They also met with staff and care providers at clinics serving transgender patients. After three months, the team compiled their findings and identified key insights into the transgender person’s experience. These insights will not only inform the next phases of Lantern — which include the design and development of gender-neutral restrooms — but will add to Kaiser Permanente’s continued work in improving transgender health through patient-centered and culturally competent care. Culturally competent care always begins with the patients’ voice — inviting patients as partners in creating the care best suited to them. For LGBT and transgender populations, Kaiser Permanente is amplifying their voice through focus groups, patient advisory councils, and other projects like Lantern, as well as best practice resources and symposia exploring improvements to LGBT health. 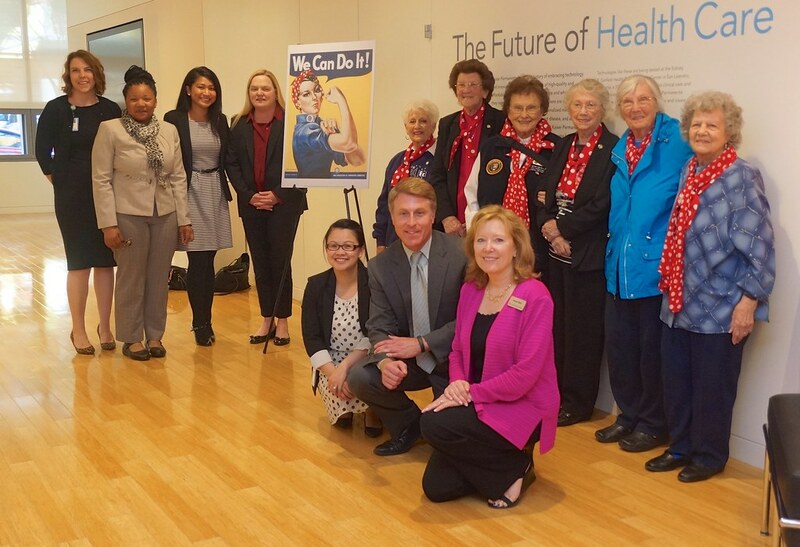 partners to assess how well care delivery is meeting needs, and make improvements where necessary. Kaiser Permanente providers and staff are increasingly offered clinical and sensitivity training as more LGBT patients seek care and support in an environment where social barriers to health are beginning to be identified and addressed. In 2012, Kaiser Permanente established a Center of Excellence in Culturally Competent Care for LGBT Health Equity, and two years later opened two transgender specialty clinics in Northern California. Previous PostPrevious Millennials: Not environmentalists and support environmental protection, for health. Me too.